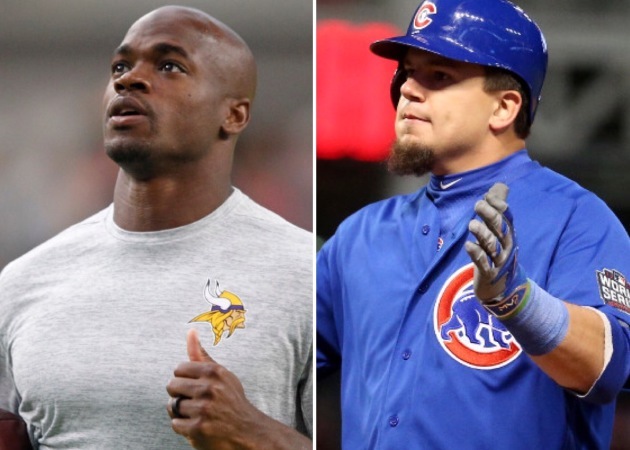 Can Adrian Peterson provide Vikings same boost Kyle Schwarber did for Cubs? A star player most of the world assumed was out for the year helped end one of professional sports’ most famous curses. Cubs fans witnessed it first-hand. Vikings fans would probably like history to repeat itself. On Oct. 26, six-plus months after the Cubs told the world and Kyle Schwarber that his season was over after he tore his ACL and LCL in a scary collision with Dexter Fowler during the Cubs’ third game of the year, he was hitting fifth for Chicago in Game 1 of the World Series. Schwarber started all four games in Cleveland as the designated hitter and finished with a .412 batting average, seven hits, three walks and two RBI. He wasn’t cleared by the medical staff to play defense. The Cubs were 3-1 with him in the lineup and scored 22 runs, compared to just the five they scored when he was on the bench. A routine checkup during the National League Championship Series might have helped end the Cubs’ 108-year-old World Series curse. Schwarber was surprisingly cleared by the doctor and within days he was playing in the Arizona Fall League trying to retrain his eyes to track pitches. World Series MVP Ben Zobrist summarized Schwarber’s comeback well by saying “It’s just crazy. It really is." The Vikings could use a little bit of that crazy in a couple months when the postseason rolls around and Adrian Peterson might be in position to deliver it. The Vikings put Peterson on the injured reserve Sept. 23, the day after he had surgery to repair a torn meniscus. The Vikings had already lost their starting quarterback with a knee injury and when Peterson went down the team’s season seemed to be at risk of falling apart. But the Vikings have persevered and are 5-2 midway through the season, on top of the NFC North and positioned well for a playoff berth. Peterson opted for a full repair through surgery and began rehab immediately. The aggressive timeline to be ready for the postseason would put Peterson back on the field just more than three months after his injury. Peterson has proven he is inspired and driven the same way Schwarber was and returned strong from past injuries. He tore his ACL and MCL in 2011 and the next season won league MVP. Then after missing all but one game in 2014, he won the NFL rushing title in 2015. But can he do it with the expectation that he might return this season to save the day? It was reported during the Vikings Monday Night Football game at Chicago this week that Peterson won’t be running anytime soon, according to athletic trainer Eric Sugarman. “Sometimes it’s our job to protect them from themselves so he doesn’t do too much too soon,” Sugarman said on the broadcast. Vikings general manager Rick Spielman said in early October, “I look at it as he’s going to do everything he can to get back. I look at it also as that’s at least eight, nine weeks of not taking hits on that body, which is going to make him pretty fresh." It’s been six weeks since Peterson’s body has taken a hit and there are nine left in the regular season. Peterson only needs to look at Schwarber’s heroic storyline for added inspiration. Maybe he can follow a similar path to help the Vikings finally win a Super Bowl?